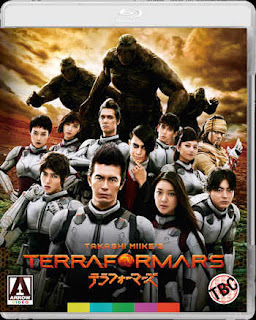 Takashi Miike's live action adaptation of the popular Japanese comic and animated series TERRA FORMARS makes its UK debut this month on Blu-Ray, courtesy of Arrow films. Set several hundred years into the future, Earth is looking to colonise Mars and have altered the atmosphere, seeded vegetation and introduced insect life, which are supposed to transform the environment ready for humans. But when the crew of a space ship crew sets down with orders to kill all the bugs ready for human colonisation, they are surprised when instead of finding lots of little cockraoches, they're confronted instead by 7ft tall humanoids. It seems evolution happens at a lot faster pace on Mars and there was a reason this particular band of criminal misfits, which range from Yakuza hit-men and terrorists to computer hackers and serial killers, were chosen for this special mission. Each crew member is given a DNA shot which will transform them into an evolved insect hybrid, with a special power that will enable them to fight these anthropomorphic insects. If you've seen The Guyver (Mutronics) you get the idea. Not your typical Takashi Miike film, this bizarre sci-fi tale, which just gets even more bizarre as it goes on, is one that I can only really recommend to fans of the original comic, animated series or fans of Japanese manga. Regular sci-fi fans may wonder what on earth they were watching, as indeed I did. Which wasn't helps by the fact the film is in Japanese with English subtitles, so you really do need to pay attention to whats going on. Outtakes (4mins) - A series of goofs and gaffs that were cut from the film. Trailers - The original theatrical trailer and 2x teaser trailers are included. Stills Gallery - Essentially a photo gallery of on set production stills. The first pressing also contains a fully illustrated collector’s booklet with new writing on the film by Tom Mes. Author of 'The Cinema of Takashi Miike'. 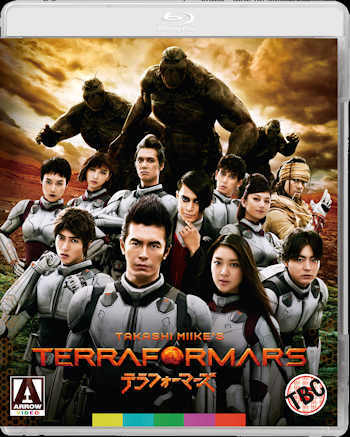 TERRA FORMARS is out now on UK BD from Arrow Video.